Hose Master’s quality commitment doesn’t stop with 100% testing of each connector. Our customer service representatives and production staff have the same goal: to provide you with the product you need, when you need it. Our FireShield and FireShield QuickClamp petroleum flex connectors are easy to install and safe to use. Click on these links for technical information and product drawings. Each comes with installation and handling instructions. FireShield connectors are the safest, longest lasting, and most flexible metal hose connectors manufactured today. Our unique processes minimize residual stress points created in the hose during the manufacturing process. Our proprietary tube seam weld technology resists aromatic vapor permeation, and our ASME certified welders follow specified procedures to insure the strongest fitting attachments. 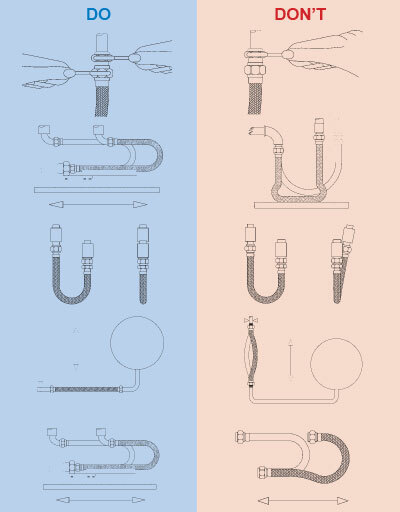 Hose Master’s extensive array of available end fittings offer the quickest and most cost-effective solutions for connecting fiberglass or flexible pipe to the submersible pump and shear valve. Hose Master’s FireShield connectors minimize threaded connections, which means fewer leak points and reduced installation time and labor. FireShield connectors meet all specifications for aboveground and underground piping applications, and comply with NFPA and UFC codes. They are rated for full vacuum and are available with BSPP and BSPT threaded fittings. Connectors are designed to accept approved secondary containment systems. Premium product, first-rate service and competitive pricing! 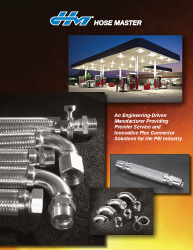 It’s easy to see why Hose Master is the industry-preferred manufacturer of flexible connectors. Hose Master’s FireShield connectors are the safest, longest lasting, and most flexible metal hose connectors manufactured today. Hose Master’s unique process makes the difference by minimizing residual stress points created in the hose during the manufacturing process. Hose Master’s proprietary tube seam weld technology resists aromatic vapor permeation and Hose Master’s precise ASME certified welders follow specified procedures to insure the strongest fitting attachments. Hose Master’s FireShield connectors meet all specifications for aboveground and underground piping applications, and comply with NFPA and UFC codes. They are rated for full vacuum and are available with BSPP and BSPT threaded fittings. Connectors are designed to accept approved secondary containment systems. 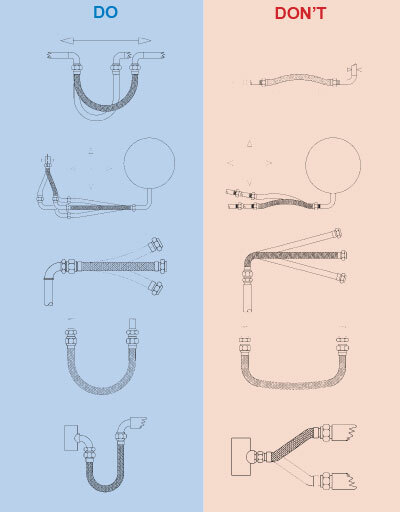 Drawings for these connectors are available below for immediate download in PDF format (IGS format available upon request). Simply click the type of connector you are looking for. All diameters and lengths are included in the PDF files. *Flex connectors available with 100% stainless steel construction for even wider compatibility with evolving fuel blends. Customers may indicate their preference for a 100% stainless flex connector for qualifying constructions by adding a “-SS” suffix to the part number. These products highlight our most commonly purchased connectors. As a manufacturer dedicated to solving all of your hose requirements, we have other models available. Hose Master’s trained technical staff will also work with you to design and manufacture custom-built connectors. Please contact our customer service team at 800-221-2319 for further details. 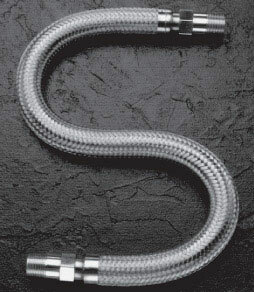 Hose Master’s plated swivel adapter converts the integral hex male to a swivel end. 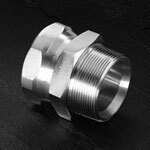 This unique adapter creates a positive metal-to-metal seal when used with Hose Master’s exclusive 30° chamfered hex male fitting. This swivel adapter facilitates installation and is only compatible with Hose Master’s FireShield or FireShield QuickClamp connectors. Hose Master’s underground connectors, used with our anode, comply with EPA regulations for buried metal components. Our easily monitored system also meets NACE RP-01-69 standards for cathodic protection. FireShield QuickClamp assemblies make tight flex connector installations as easy as possible. Offered with a multitude of end connections (including FRP fittings) and custom hose lengths, FireShield QuickClamp assemblies offer installers the ability to fasten one or both ends of a connector within a piping system with minimal use of tools – eliminating timely labor costs and increasing profits. These products highlight our most commonly purchased connectors. 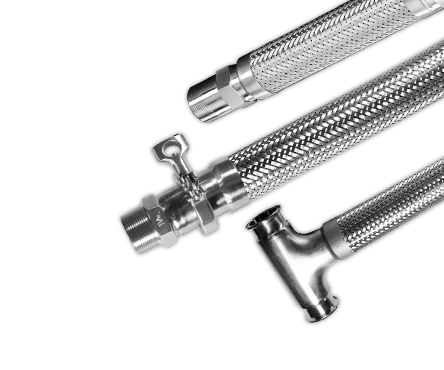 As a manufacturer dedicated to solving all of your hose requirements, we have other models available. Hose Master’s trained technical staff will also work with you to design and manufacture custom-built connectors. Please contact our customer service department for further details. In addition to standard QuickClamp flex connectors, Hose Master offers accessory components to easily interchange and install flex connectors with a variety of end connection options. QuickClamp accessory items feature a stainless steel construction ensuring compatibility with the widest range of fuels including gasoline, gasoline-ethanol blends, ethanol, diesel, and biofuels. DEF Flex Connectors are designed and manufactured to meet the specific corrosive environments encountered when transferring Diesel Exhaust Fluid (DEF). Other sizes, lengths and stainless end connections are available upon request. The working pressure is rated at ambient temperatures. Working pressure changes to 50 psi when using a FireShield integral hex swivel fitting or QuickClamp coupling. The minimum bend radius is measured from the centerline of the hose. DO design the installation to allow for all movement (ground, vibration, etc.) after the installation. DO keep the hose free from all objects and debris. DO measure to ensure proper length of connector has been selected. DO handle and store the connectors carefully before an installation. DO follow all printed instructions included with the connectors. DO note the minimum bend radius as specified. DO install flexible connectors so that the bend is as close to the center of the connector as possible. DO keep the painted lay line straight and on the centerline of the connector. DO use a wrench only on the hex flats. DO use the manufacturer’s recommended cathodic protection system or dielectric isolation boot. DO check for leaks before covering the installation. DON’T use a wrench or any other tool on the hose or braid collar. DON’T twist or torque the flex connector. DON’T over-bend a flexible connector beyond its minimum bend radius. DON’T install a flexible connector with the bend next to the end fittings. DON’T attempt to stretch or compress a flexible connector to fit an installation, or allow connector to stretch or compress during use. DON’T restrict flexibility by allowing a connector to come into contact with other components or equipment during an installation or during use. DON’T expose connector to damage or corrosives during storage, installation or use. Groundwater, road salt, soil, etc. are or may contain corrosives. If necessary use a cover or boot to protect the connector. DON’T attempt to reuse a flex connector once it has been installed.